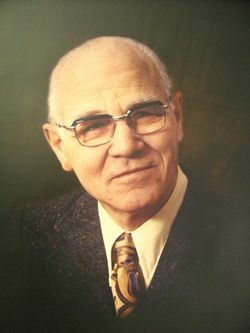 Bernhard J. Braun: pastor, educator, and missionary in the Mennonite Brethren Church in North America and Europe for nearly 50 years; born 10 February 1907 in Kantserovka, Orenburg Mennonite Settlement, Russia, the son of Johann I. Braun (5 June 1861, Russia - 5 July 1926) and Maria (Penner) Braun (30 August 1863, Russia - 10 July 1950, British Columbia). The first wife of Bernhard was Linda Marie Ewert (24 November 1908, Mountain Lake, Minnesota - 15 July 1983, Reedley, California). She was the daughter of Jacob H. Ewert (1873-1952) and Anna (Wiebe) Ewert (1886-1977). They were married on 22 August 1934 in Mountain Lake, Minnesota. Benjamin and Linda had five children: Rose, Donald, Darlene, Ruth, and Judith. The second wife of Bernhard was Marie Pauline "Marty" (Toews) Brandt (14 April 1918, Enid, Oklahoma - 1985). She was the daughter of Gerhard G. Toews (1886-1972) and Eva (Huebert) Toews (1887-1964). Bernhard grew up in the Orenburg Mennonite settlement near the Ural foothills of central Russia, where Mennonites had pioneered since 1894. The youngest of 14 children, he saw and felt family struggles for existence, uncertainties during World War I, and the terrors of the Russian Revolution and ensuing unrest in the land. These experiences contributed to his knowledge of God's sovereign love and grace and helped shape his cultural, moral, and spiritual values as a discipline of life. At age 19, he immigrated to Canada. He worked as a farm laborer to pay the debt incurred through that move. Sensing the call to Christian service, Braun trusted God for resources to acquire needed education. He went to Tabor Academy and then studied at Tabor College. On 22 August 1934 he married Linda Marie Ewert (1908-83) of Mountain Lake, Minnesota. They became parents of five children. Braun entered social work and business ventures. Things went well and "the treasures of Egypt " (Hebrews 11:26) were attractive. But the call of the Lord was heavy upon the young couple. After one year of studies at the Baptist Theological Seminary in Fort Worth, Texas, the Brauns accepted the pastorate of the Carson Mennonite Brethren Church, Delft, Minnesota, in 1939. They were both gifted servants, complementing each other. While Linda used her gifts of caregiving in quiet, tender ways, Bernhard's ministry was more public in nature. With short intervals of graduate studies, he served on all levels of denominational leadership, including 27 years as pastor in Minnesota and California, 10 years as president of Pacific Bible Institute (1947-50) and the Mennonite Brethren Biblical Seminary (1955-62), and concurrently 14 years on the Board of Reference and Counsel. The Brauns also worked together as missionaries in Europe under Mennonite Brethren Missions and Services for 13 years (1964-77), evangelizing, preaching, and teaching. Students there speak with fondness of "Mama Braun" and "Papa Braun." After Linda Ewert Braun's death in 1983, Bernhard Braun married Mary Brandt a year later, one year before his sudden death on 9 July 1985 in Idaho. He was buried in Dinuba, California. Christian Leader (23 July 1985): 22. GRANDMA (The Genealogical Registry and Database of Mennonite Ancestry) Database, 5.00 ed. Fresno, CA: California Mennonite Historical Society, 2006: #11433. Mennonite Brethren Herald (20 September 1985): 21. Kasdorf, Hans and Richard D. Thiessen. "Braun, Bernhard J. (1907-1985)." Global Anabaptist Mennonite Encyclopedia Online. March 2007. Web. 22 Apr 2019. http://gameo.org/index.php?title=Braun,_Bernhard_J._(1907-1985)&oldid=123294. Kasdorf, Hans and Richard D. Thiessen. (March 2007). Braun, Bernhard J. (1907-1985). Global Anabaptist Mennonite Encyclopedia Online. Retrieved 22 April 2019, from http://gameo.org/index.php?title=Braun,_Bernhard_J._(1907-1985)&oldid=123294. Adapted by permission of Herald Press, Harrisonburg, Virginia, from Mennonite Encyclopedia, Vol. 5, p. 93-94. All rights reserved. This page was last modified on 27 June 2014, at 15:20.